Bracha Chyutin graduated from the Technion (Israel Institute of Technology) in Haifa, Faculty of Architecture (1971). She has been a visiting lecturer at the Technion and at Tel Aviv University. Michael Chyutin graduated from the Technion (Israel Institute for Technology), Faculty of Civil Engineering (B.Sc., 1963; M.Sc., 1967) and Faculty of Architecture (B.Arch., 1966; Ph.D., 1975). He has been a visiting lecturer at the Technion, at Tel Aviv University, and at the Bezalel Academy of Art and Design, Jerusalem. He is also known as a scholar of the Hebrew Scriptures, of the Dead Sea Scrolls, and of Judaism prior to the Christian era, and has published numerous books and papers on these subjects. 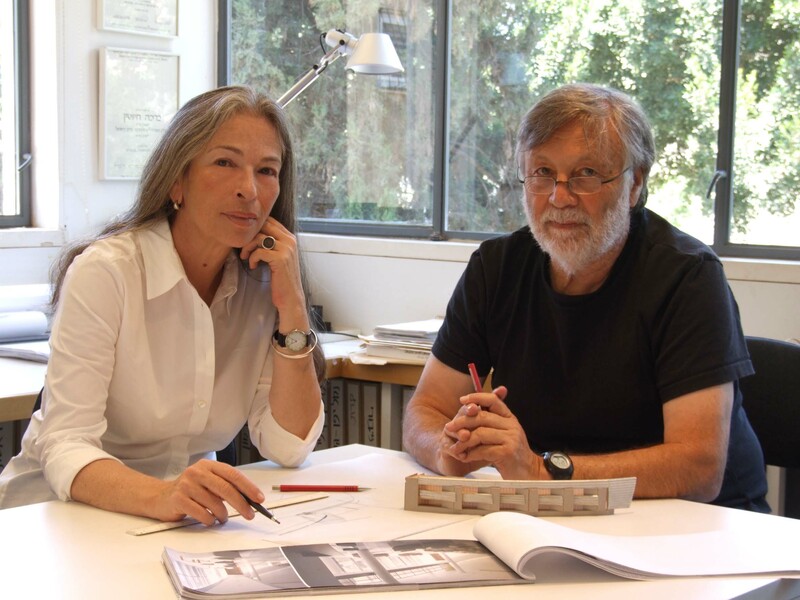 Chyutin Architects was founded by Bracha Chyutin and Michael Chyutin in 1978 The firm specializes in architectural design of public buildings, residential buildings and interiors, and in urban planning. The firm has been responsible for the design of the master plans for several academic campuses and buildings, as well as for many culture and education complexes. Chyutin Architects has won many national open competitions for public buildings: for the Mané Katz Museum in Haifa (2000), for the Court of Justice building in Haifa (1994), for the Court of Justice building in Jerusalem (2007), and for several university and cultural buildings. In recognition of its architectural achievements, the firm has been awarded a number of major national distinctions: the Israeli Architects’ Association Award (1993), the Israeli Interior Design Association Award (2005) and the Ministry of Education and Culture’s Rechter Award (1996, 2006, 2018). The firm’s designs have been shown at numerous national and international architectural exhibitions, and have been written about in the daily press and in professional journals throughout the world. Bracha Chyutin and Michael Chyutin still engage in academic activity in most of Israel’s universities. They have published a large number of papers and studies about architecture and urban planning, and have co-authored several books, among them Architecture and Utopia – The Israeli Experiment (Ashgate Publishing, London, 2007), Architecture for Justice (Tel Aviv Museum of Art, 2006), Architecture of Ben-Gurion University 1990-2006 (Ben-Gurion University Press, Beer Sheva 2008). We believe that the panorama of architecture is multi-faceted and abounds in possibilities, and that every architect is a gardener in his garden. The buildings that we plan are a synthesis and a personal interpretation of everything we have learned from our predecessors and our contemporaries, in an endeavor to add a private drop to the common sea. These buildings are born of Western culture, which grants freedom of choice among countless legitimate possibilities. They are also Jewish, in that they sever themselves from figurativity and aspire to the abstract, to the spirit that is the essence of the material. And they are Israeli too, in their adherence to the homeland’s landscapes: to its inanimate matter, to its vegetation, and to its color that is revealed by the blazing sun.Each building is a unique opportunity and a new beginning. We do not have a way, we do not have a goal, we do not have a truth. We have only hesitations, which are accompanied by a faith that hidden in every problem and in every site is the building that responds to our inner world, and if we keep on seeking and don’t give up we will uncover it.